This is a woman whose name is well-known throughout the world. Not only because of who she was but of her good acts towards people, especially the poor. She spent more than fifty years in the poor neighborhoods of Calcutta, India where she was dedicated to helping others, she taught the little ones, helped those who were sick and gave food to those who were hungry. But what’s most remarkable about Mother Teresa is that although she was highly praised by many, she gave all the Glory and credit to Jesus. Even though many people consider her as a person who always was leaning strongly on her faith, this movie reflects that but also it sheds light on some details we didn’t know. 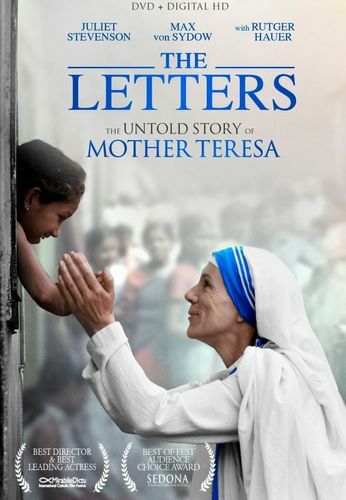 The Letters is about the life of Mother Teresa explained through the letters she sent to her mentor and friend Father Celeste van Exem throughout the fifty years she spent serving others. Usually, for people who do exceptional works are often considered for sainthood by the Catholic church so when Teresa passed away she was quickly considered. But the Vatican soon heard of more than six thousand letters from Teresa. These letters show her journey in ministry throughout the years but also how she was in spiritual pain. Describing how she thought God was nowhere near her and all she deeply wanted was to feel His presence. That even though she knew God had called her and used her, she still felt far from Him for many, many decades of her life. These letters were meant to never see the light of day or to be read by anyone. In fact, she wanted those letters destroyed after she had passed on since she didn’t want people to focus on her troubles and not on Jesus. Teresa began as a teacher and a nun in Loreto Convent in Calcutta, India where she received the second call where she felt Jesus urging her to help and work with the most poor. At that point, she was prohibited to step outside the convent but she felt compelled and sure that that was what she needed to do. Loreto Convent’s Reverend Mother thinks that Teresa’s call to help others, especially the poor is silliness but she continued on in pursuit of accomplishing her calling. What Teresa wants to do has arrived to the ears of many of the convent’s members. Occasionally other nuns and some of the priests would gather and speaks about Teresa and her work. Teresa consistently asks Rome for permission to go outside of the convent but when the Reverend Mother continues to resist, Teresa must go to a higher power. She asks the Vatican, the Pope himself, to consider her work outside of the convent as a separate fellowship which will separate her from the religious order already in the convent. Teresa’s petition is validated and manages to receive the Pope’s blessing, now she can fulfill her calling as she felt in her heart. Teresa, later on, leaves the Convent with very little money to her name. When she begins interacting with the poor from the slums of Calcutta she is not very well received. Many Hindus were hesitant towards her since they had their own religion already and didn’t need to be converted into what she believed. But Teresa’s approach wasn’t conversion, it was compassion. She changed people’s mind as she continued devoted to the forgotten and helping those who were left on the streets to perish. Later on, in The Letters we continue seeing the depth of her humbling spirit, for example, a man gives Teresa the upper floor of his home for her to live and immediately apologizes for not having all the best furnishings. But since Teresa was so simple, she actually asked for less furniture than the ones that part of the house came with. Also, her humbling spirit is shown when a reporter approaches her and wants to interview her about her humanitarian work, she refuses but actually points him to the slums and the poor people of India. Meaning that there was his story, not her.